A world in turmoil is also a world ripe for transformation. 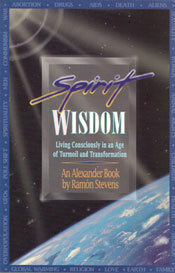 In Spirit Wisdom, Alexander illuminates the deeper meanings beneath many of today's most critical issues, offering a blueprint for personal and cultural transformation. Topics include AIDS and ecological crisis; probable and multiple selves; love and romance; spirituality and religion; the electromagnetic body; UFOs and aliens; abortion; death and the spiritual realm; cyberspace; and much more. Capitalism is fueled by the goal of perpetual growth. This fixation with linear economic growth violates nature's principle of working in cycles, feedback, loops. Since western culture's economy is built on the two pillars of consumerism and war, and since both pillars require the destruction of natural resources, the goal of perpetually expanding such an economy is ultimately suicidal. Like a feckless heir carelessly spending his inheritance, western culture grinds up its capitalnatural resourcesfar faster than nature can replace it. The ultimate outcome of such a system is not only collapse of the economy, but of the global ecosystem as well. Little thought is given to the consequences of stringing power lines across the continents and under the oceans, of filling with electromagnetic spectrum with radio and television signals, of the power plants generating electricity to light the world. Little thought is given because so little is known of the earth's electromagnetic field and its role in sustaining surface life. Every ecological problem must be subsumed under the profoundest threat to life on earth: the proliferation of manmade electromagnetic fields which blanket the earth. The earth's electromagnetic field, on which it depends to apprise itself of universal conditions and to protect itself and its creatures, is literally being destroyed. If you were placed in a room and bombarded with ear-shattering music, blinded by flashing lights, while your skin was jabbed with needles, how well could you function? That is the condition in which the human species has now placed the earth. AIDS is not primarily a human disease, nor the result of a mysterious virus appearing from nowhere a decade or so ago. AIDS, rather, is a "stepped down" version of the breakdown of the global immune system. It is a reflection of the earth's condition as it struggles to maintain its health against the electromagnetic onslaught wreaked by the human species. Because the human organism communes with and is affected by the larger global organism, it replicates the earth's struggle with its own version of immune system breakdown. While attributing the disease to a virus, a tiny agent invading the body, the disease truly arises from a larger context, from the earth's impaired condition. The relationship between the AIDS virus and the human body precisely reflects that between the human species and the earth: a deliberate, though unconscious, destruction of the immune system leading to systemic breakdown. The human species arises from a single pool of consciousness, which might be termed the "human pool." This pool, as it descends levels of vibration to vitalize beings at the level of physical matter, fragments and splinters into increasingly fine focuses of intent, weaving the patterns of human diversity. Any great division must be made for a purpose; it naturally flows that men and women are fundamentally different; that the division of consciousness lying behind the creation of two sexes implies that each carries a unique purpose or quality. The most fundamental quality of human existencematter animated by spiritis the basis of the two sexes. To woman falls the mantle of spiritual guardian of the earth. This means that woman's primary psychological coloration is spiritual; that matters of the heart, of love, of connection, of drawing together, are her most natural qualities. If woman's nature is essentially spiritual, meaning that she dwells primarily in the realm of consciousness, by looking at consciousness we can understand how woman's qualities naturally flow from it. Pure consciousness, divorced from matter, has a tendency to "rise up" to ever greater levels. Just as human consciousness at its highest is an amorphous, united pool of consciousness, so then does human consciousness join with all plant and animal consciousness to form an even higher "earth consciousness," and so on. So if woman's focus is primarily spiritual, reflecting the qualities of consciousness, she has a natural tendency to "draw together," to include, to open her arms wide and embrace the different, the small, the weak and helpless. Women predominate in the helping professions as teachers, social workers, nurses, and volunteers, because these provide outlets for the feminine qualities of love, comfort, and aid. You are consciousness embedded in physical form. As woman is aligned with your spiritual nature, to man falls the focus of material mastery and manipulation. Man's emphasis is on structure, form, reason, logic, creation, destruction, and power as defined in terms of wealth and territory. While woman gazes inward, toward the heart and soul, man gazes firmly outward, into the physical medium. The overarching masculine theme is the dynamic play of creation and destruction. Like exuberant children building sand castles and kicking them over, man focuses his energy on creating ever more elaborate, detailed, intricate, and complex structures, then either destroying them or (preferably) destroying someone else's. This is true both in terms of physical structuresbuildings, temples, and so forthand in human institutions such as government, business, and religion. The focus is on creation of new forms on the dust of the old. Because man's focus is on physical expression, there is a greater variety of personality types, talents, intelligence, and pathology than among women. Woman is aligned with your spiritual source, a constant flow of energy which provides a steady bedrock foundation. Man is less influenced by this foundation, and therefore splashes out into the physical medium in greater variety: saint and sinner, killer and healer, genius and idiot, commando and pastor. The boundaries of human expression are broader for men than for women, as a general rule. Among the uncountable species of plants offering life and comfort to humanity, a relative few contain compounds which directly alter human consciousness. To understand the process, let us look briefly at the relationship between consciousness and the body. The body is built to reinforce the restricted scope of human consciousness. That is, its chemical processes form an elaborate framework funneling the swarms of consciousness which bathe you, unseen, into narrow bands of vibration granted access to the brain: these are your senses…All five senses have as their primary purpose helping you to navigate a clear course through the material world; secondarily, they reinforce the inborn and culturally imposed limits on human consciousness by not permitting most of the swirling energy fields about you to reach conscious awareness. There are dangers in structuring human consciousness this way: danger that the ego, the identification with one body and fear for its survival, will rise to supremacy; danger that the twin pillars of human life, spirit and reason, will be forgotten in favor of gross materialism; danger that the ability to love and feel fully will be crippled by unnatural cultural constraints on emotional expression; danger that the awareness of underlying unity and oneness with the cosmos will be lost. To help protect humanity from expressing its potential for ego- based, materialistic, soulless cultureand the cultural chaos and disintegration inevitably followingamong its store of helpful plants nature produces those containing compounds which alter human consciousness. In truth, they do not alter human consciousness as much as they restore it to a higher, truer, purer level of awareness, freed from a few of the inborn and cultural shackles narrowing experience. They untie the neurochemical straitjackets through which incoming energies are reduced to a few narrow bands of sensory impression; they release the dependence on symbolic experience of energy patterns, allowing a direct apprehension of realms of consciousness never experienced by everyday consciousness. Order book or Kindle book.